Earth Systems has become expert in the design and implementation of portable in-situ or direct dosing water treatment systems. Based on Earth Systems patented Neutra-Mill technology, treatment is conducted directly into the affected water body (in-situ / direct dosing) avoiding the need for costly pumping and piping infrastructure to transport the polluted water to a treatment plant. 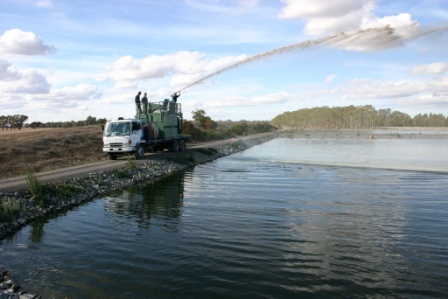 Treatment can be conducted from either floating water based or adjacent land-based mixing and dosing systems. These innovative treatment systems have evolved as a result of our water quality expertise and our ability to identify and design flexible treatment solutions applicable to a wide range of active, decommissioned, limited and remote access sites. Earth Systems provides an innovative range of portable water treatment products and accessories based on our patented Neutra-Mill technology. Our water treatment range includes the following products and accessories. Earth Systems’ water-based mixing and dosing units are suitable for many water treatment applications. These units avoid pumping and piping costs, and despite their size, have large reagent throughputs. If you are seeking cost effective, flexible, dependable and robust mixing and dosing units, then consider a water-based system employing our patented Neutra-Mill technology. The rapidTREAT systems are portable, skid mounted units that are sized to permit mounting on a flat-bed truck. This provides flexibility for treatment locations that are difficult to access, and permits the system to be either used at a fixed location or moved to multiple locations. With the capability of mixing and dispensing many reagents, they can be used for a range of water treatment applications (eg. pH control, turbidity control, metal reduction, cyanide treatment, nutrient pollution… etc). Earth Systems’ produces a range of vertical mixing tanks for automated dosing of powdered and liquid reagents. These can be configured with a range of options for dosing and monitoring. The system comes in a variety of sizes to suite all applications, large or small. Earth Systems’ success in resolving water treatment issues with our own patented technology is well evidenced by the following selected case studies. An abandoned gold mine with a copper-rich pit lake required rehabilitation. The site was remote and no infrastructure was available. A portable Multi-Purpose Neutra-Mill was transported to the site, using a conventional vehicle and trailer, and the pit lake treated to reduce copper levels. The treated water satisfied requirements for discharge to a nearby creek flowing through a national park. For further information Click Here..
A single portable Turbidity Mill is used as a coagulation/flocculation system for the drinking water of five separate towns in central Victoria, Australia. Significant reductions in capital requirements and operating costs were achieved. The portability of the system also provides managers of the water supply assets with much greater flexibility in their operations. 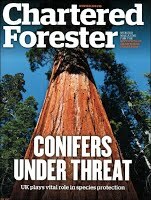 For further information Click Here.. Acidic stormwater collection ponds at a coal loading facility in Indonesia are treated with a Multi-Purpose Neutra-Mill to correct pH. The treated water is re-used for dust suppression within the loading facility, reducing the need for additional clean water to be brought on to site. For further information Click Here.. Acidic leachate from a landfill was emitting offensive and toxic hydrogen sulphide odours and attracting complaints from residents and the attention of the local environmental protection authority. The water was treated using a portable Multi-Purpose Neutra-Mill to raise the pH to 10.5 within 48 hours. Suspended solids, including bacteria were settled within the impoundments and the treated water was suitable for re-use at a nearby sand mine. 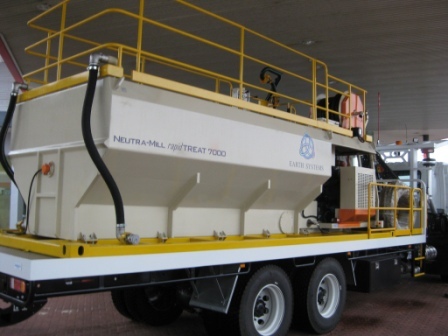 For further information Click Here..
A portable Turbidity Mill is used at a large coal mine in the tropics to reduce the turbidity in collected stormwater. Following treatment the stormwater is either discharged offsite or reused onsite. 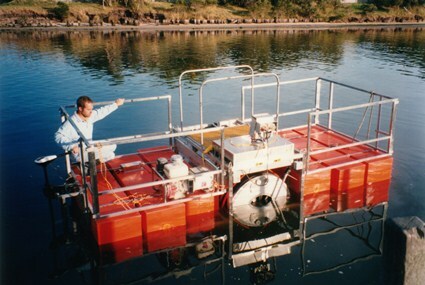 The unit is easily transported between the various water bodies requiring treatment. Treatment is conducted using alum (aluminium sulphate hydrate) and hydrated lime. For further information Click Here.. The tailings pond at a heap leach gold mine in the US was undergoing regular pH adjustment using liquid sodium hydroxide. 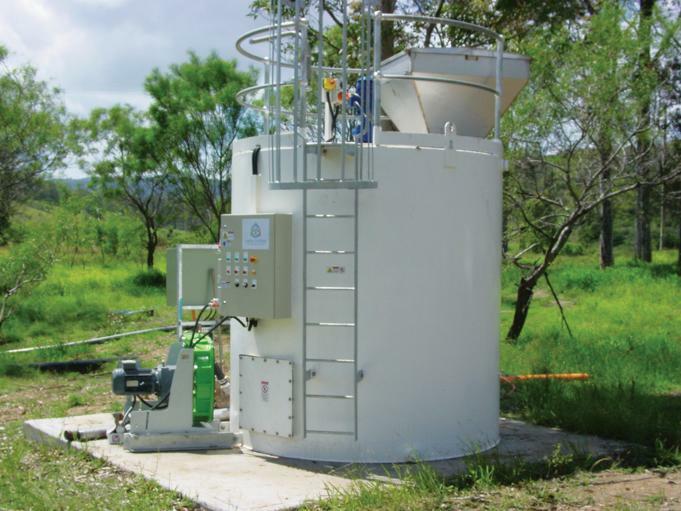 A trial at the site demonstrated potential annual reagent cost savings of US$400,000 if the existing sodium hydroxide system was replaced by a portable Multi-Purpose Neutra-Mill dispensing hydrated lime. For further information Click Here..
A base metal mine on ‘care and maintenance’ needed to raise the pH of a 180 million litre tailings dam. A portable Multi-Purpose Neutra-Mill was placed directly in the tailings dam and dispensed 180 tonnes of hydrated lime to raise the pH from 2.8 to 8.0. Treatment was conducted by the 2 site staff in conjunction with their daily care and maintenance tasks. For further information Click Here..